What Tools Do I Need To Build Drums? It seems like I’ve gotten more emails than usual from people interested in building custom drums that just want to know what tools they will need to start building drums. To answer this question I will be writing a 2 part blog post. The first post will list and discuss the bare essentials for building custom drums, and the second post will list and discuss in more depth some of the drum building tools that you’ll need to have if you plan on building drums long term. …That’s it. 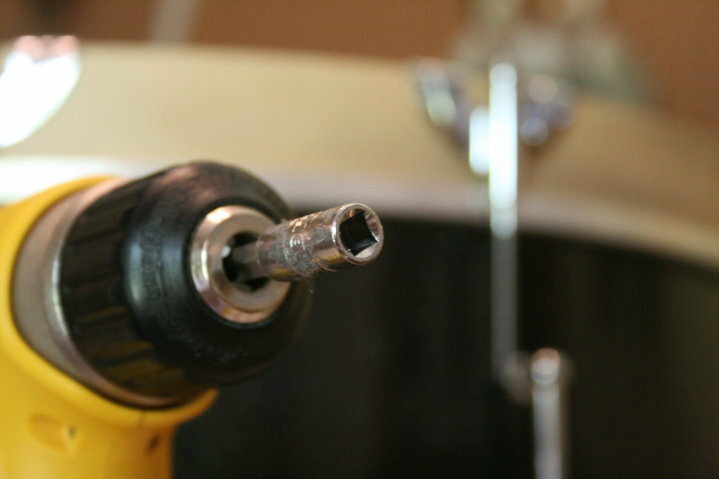 The only tool you need to build your first drum is a screwdriver. You may think I have fallen off of my rocker, but the very first drum set that I ever built was acomplished using only a screwdriver! Here is the bottom line, there are drum supply companies out there that want nothing more than to get your business, in fact they want your business so much that if you buy all of your parts from them (drum shell, drum lugs, tension rods, hoops, lug screws, etc…) they will drill the holes for all of your hardware, cut the bearing edges on your drums, and even cut your snare bed! They will then ship you the drum shell and your hardware and the only thing you have to do now is assemble the drum – that’s where your screwdriver comes in handy! Now, I realize most people that want to build a “custom” drum don’t want a plain looking drum. There are steps in between getting your supplies in the mail and assembling the drum that can make your drums have a custom look to them, such as staining, painting and wrapping your drums. Those are the steps that truly make your drum “custom” and to customize your drums you only need a few more tools/supplies. For those of you who want to learn more about the correct staining and clear coating process for drums, you can sign up on the email list and I’ll send you some free information that comes straight from my eBook, or if you are ready to go even deeper into the art of drum building you can buy the eBook! Again, for those of you who want to learn the in’s and outs of wrapping a drum shell, you can sign up for the email list and I’ll send you a “How to Wrap Drums” tutorial totally free of charge! So really, to get started in customizing your drums your only going to be out about $30 (not including the cost of drum parts). A small price to pay for the ultimate satisfaction of having a drum or drum set that is totally customized to your style! I’ll be posting a more in depth list of drum building tools soon! The next list will go into more detail of what I use on a day to day basis for building custom drums at P.Ellis Drums! As always comments and questions are encouraged! please tell me how to make a drum shell at home. I have actually never made my own drum shell, but theoretically I know how…that doesn’t mean it will be good…but it will be a drum shell…heh. I recommend getting your drum shells from someone like Keller or Gladstone. They have spent years perfecting their craft, and will provide you with a great drum shell. Phil, This website is so awesome. I also go to church at the stone, and love watching yall play. Playing the drums has been my greatest love ever since i can remember, and i have been really wanting to learn how to build my own kit, but could never find anywhere that would tell me how to get started. Thank you so much! Thanks for the kind words Tyler! I’m glad you found the site, and I hope it inspires you to build drums! Come say hi at the Stone sometime. Being an avid woodworker, I can see myself wanting to dive right in and make a set of drums. Thanks again for the information to help get us started!